These new chocolates from Green and Black’s come in a sharing bag and are flavoured with raspberry. As some who likes fruit creams I thought that these might just hit the mark. The bag is re-sealable and I poured a few out as a portion. 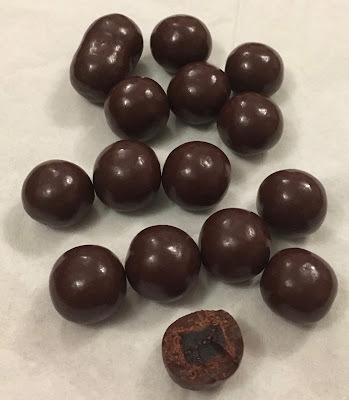 The chocolates are very dark in colour, showing the strength of the cocoa, but I couldn’t seem to find the percentage of this on the bag. The chocolates are glossy, and I gave one a try. 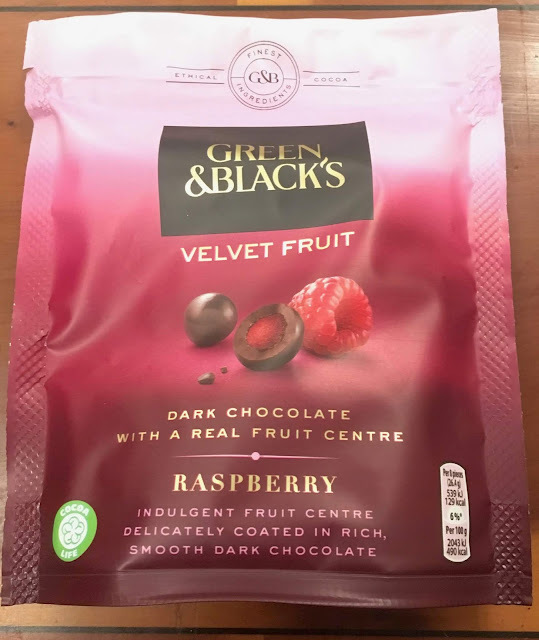 I think these might have been the first Green and Black’s chocolate I wasn’t fussed by. The filling is a hard raspberry jelly, it is a little chewy and not particularly a texture I enjoyed. The flavour was very confused the chocolate was very strong and the filling was very zingy, and the two together to me seemed to be in fight with each one trying to take the lead and nobody was winning. I actually ate one slowly and found that much better, I sucked the chocolate off and ate what turned out to be a cube of jelly after. From this I could pick up on the rich smooth chocolate, and I had a better sense of how zingy the jelly was, and what a nice raspberry flavour it had. Together though, it was just a bit much for my tastebuds. I also picked up a bag of the orange version of these chocolates, I’m hoping they are a bit more mellow. I'm not a fan of this entire range myself. I've eaten not bothered reviewing it as I tend to find it pretty appalling. The chocolate is so often off the mark in the flavour and once I even found it tastes oddly of sour milk. Apparently their research says 'customers want dark chocolate that doesn't taste like dark chocolate', which boggles the mind entirely. This range is a retrograde move from Mondeliz and I'm largely avoiding trying it. PS - the darker colour tends to come more from the roasting as opposed to the cocoa content. Over-roasted cocoa can be almost black (and taste awful).